A Kansas-based farmer and rancher has released his debut fiction volume comprised of three books, which unfold the saga of a young, God-fearing nation that must grapple with tyranny from without and dissention from within. 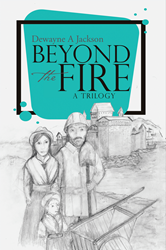 In “Beyond the Fire,” author Dewayne A Jackson spins a memorable tale about remaining loyal to both family and faith. Jackson’s book opens on protagonist Destry Cotton’s Christmas journey to the fictional, blizzard-stricken land of Amity, where her husband’s family resides. Trapped with her in-laws by the wintery deluge, family patriarch Bill Cotton details Amity’s rich history to Destry and reveals his own need for God’s intervention in the face of doubt and fear, which had ravaged their home and nation. With detailed mapping of the story’s fictitious world and an eclectic cast of characters, Jackson’s book puts forth the compelling and adventurous tale of one family’s struggle to overcome upheaval, revolt and war and find ultimate solace in each other and God. Dewayne A Jackson lives and farms in rural northwestern Kansas. Jackson holds a bachelor’s degree in agriculture from McPherson College and enjoys part-time ministry as a lay speaker in several small community churches. He currently resides in Norcatur, Kan., with his wife. To learn more, please visit http://www.prairiepens.com.